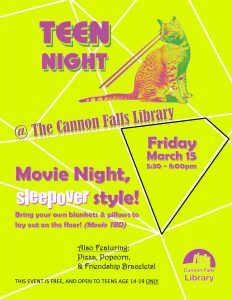 Teens join us for a movie night sleepover style. Bring your own blankets & pillow to lay on the floor. The movie will be determined by popular vote. Pizza, Popcorn and Friendship Bracelets too. Teens only event for ages 14-19. Posted in News, Teen Programs.